Sushant Singh Rajput may have been a day late with his Throwback Thursday post but in it, he gave a glimpse of his preparation for upcoming film Kedarnath. 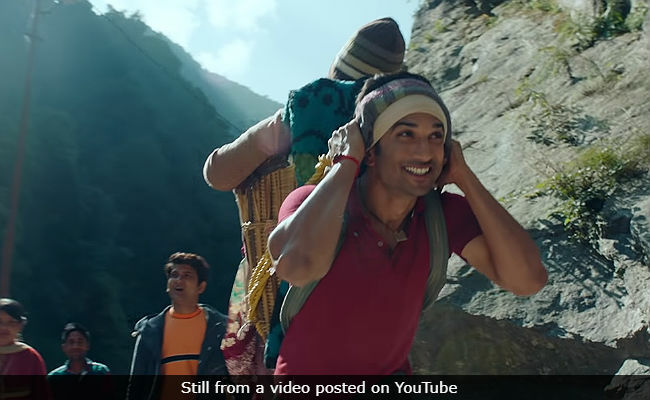 Sushant, who plays the role of a Muslim porter who earns a living by helping Hindu pilgrims cover the Kedarnath trek, prepared for the role on a treadmill with a sandbag. Sushant juxtaposed a picture taken during a training session with a still from the film, in which he can be seen carrying a pilgrim to the shrine in a 'kandi.' Sushant's Instafam is impressed. "I like your dedication to work... May Lord Shiva give huge success to your movie," an Instagram user wrote. "It's so inspiring to see a person of your stature with such devotion. I can't wait enough to see the movie," read a comment. Kedarnath is the story of a Hindu pilgrim Mukku (played by Sara Ali Khan) and a Muslim porter Mansoor (Sushant), who fall in love during the trek to Kedarnath. Mukku's family is against their relationship, which in turn is tested by the wrath of the nature when Kedarnath is flooded following incessant rains and a cloud burst. The film's plot is set against the backdrop of 2013 Kedarnath floods. Kedarnath, directed by Abhishek Kapoor, is Sara Ali Khan's Bollywood debut film. Abhishek also directed Sushant in his first Bollywood film - 2013's Kai Po Che!. After Kedarnath, Sara Ali Khan will be seen in Rohit Shetty's Simmba, opposite Ranveer Singh. Kedarnath releases on December 7 while Simmba opens in theatres on December 28.